Soft cover, 124 Pages, 80 Photographs. The vision, achievements and War Service of Australian pioneer aviator Douglas Sloane 1890-1917. 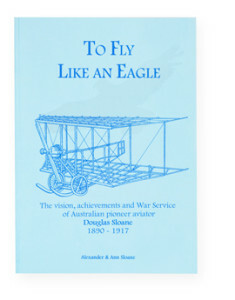 An inspirational biography of one of Australia’s earliest aviators. With rare ingenuity and determination, this young man persevered with his boyhood dream of “flying like an eagle”. The flying abilities of the magnificent wedge-tailed eagle of his home property inspired Douglas to design and build his own airplane, working with his considerable engineering skills but basic materials. “When World War One broke out in Europe, Douglas joined the Australian Flying Corps. After a brief training period at Point Cook near Melbourne, he was sent to England, joining the 69th Squadron R.F.C. at South Carlton training base near Lincoln. During his training as an air mechanic, he corresponded frequently and in detail with his family in Australia, as did his brother Alex, also fighting in Europe.